Age-Defying Fitness – Peachtree Publishing Company Inc. Growing older does not mean accepting diminished fitness. There is no doubt that our bodies change with age. But many of the problems attributed to inevitable age-related changes are, in fact, not inevitable and are often lifestyle-induced and reversible. Two of the nation’s top physical therapists show how to assess fitness levels and create a specific profile to achieve optimum physical health. Marilyn Moffat and Carole B. Lewis explain how to overcome the aches, stiffness, and unsteadiness in muscles and joints. Using their simple, self-administered tests, you can assess your level of physical performance in five critical domains: posture, balance, strength, flexibility, and endurance. You can also develop a personal profile according to the results of these tests. Easy-to-follow strengthening and stretching exercises accompany a Thera-Band ® resistive exercise band. 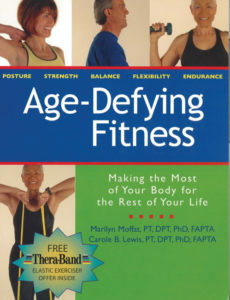 More than a simple how-to book, Age-Defying Fitness encourages you to take responsibility for your physical well-being, and offers an easy everyday approach to achieving better health. To purchase a Thera-Band ® individually, please contact The Hygenic Corporation at their toll-free number: 1 (800) 321-2135. Marilyn Moffat, PT, PhD, an internationally recognized leader in the field of physical therapy, is a professor of physical therapy at New York University and has also been in private practice for almost forty years. She lives in New York. Carole B. Lewis, PT, PhD, is founder and owner of a large physical therapy practice in Washington, DC. She serves on the medical faculty of George Washington University. Lewis has published numerous textbooks and articles in the field of aging. She lives in Maryland.